16.3 - 1500lb WC & 4X RWC 2X Top 5 at Select WS. 1st Cremello Stud EVER to achieve AQHA Halter ROM & be in Top 5 at AQHA World Show! 50 AQHA Grand/Reserves. 41X WC/RWC & APHA Congress Champion & Bronze Trophy Sire. GFTG Overall Sire of the year 2015.GFTG Weanling Mare Sire of the year 2013, 2014, 2015,2016,2017 and Weanling Colt Sire of the Year 2018. His foals also swept the Iowa Breeders Futurity in 2015. Several,of his foals have gone on to ride! Guaranteed color on non-gray mares. 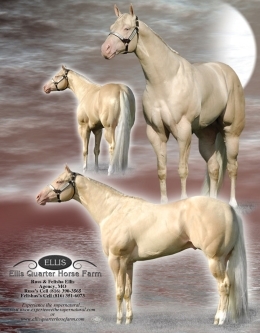 This breeding is for non-dilute(sorrel, chestnut, bay, brown or black) mares only.